Welcome to the Knowledge Vault! Here you will find links to several studies and article on many wine making topics. This area is designed to offer you views on controversial issues from cork taint and closure type to extended maceration theories and much more. Allowing you views from professors to veteran wine makers so you may decide for yourself what is the best course of action for your wine making. After all, the most enjoyable thing about wine making is your chance to have a unique wine designed by your actions and belief in your wine making practices, so go on have fun! Your first step should be to do a 15 minute “break in” of the impeller. Generously apply some food grade silicone lubricant to both sides of the impeller. Connect hoses to each side and run put them in a large bucket or bin filled with water. The pumps are operated completely from the yellow remote. There is no need to use the front control panel for normal operation. To operate the pump make sure the bottom dial on the remote is turned all the way to the left. This is the speed control. Turned to the left is off and the right is full speed. Turn the speed control quickly to the right about half way. This is done because it can be hard to get the impeller to start turning. If you do this too slowly the display might read an error message (Such as “SP”). If it does, simply un plug the pump and wait 90 seconds before plugging it back it and try again. Once the pump is operating the display will show the speed with 0 being the slowest and 60 being the fastest. For the “break in” period keep the speed around 30 (half way) and let it pump water for around 15 minutes. This is done to soften the impeller so it will be easier to get started in the future. Your pump should now be ready for normal operation. The Vigor 150, 200, & 300 are not designed to run at extremely slow speeds (under 10) for extended periods of time. This can put a lot of strain on the motors and can overheat them. If you need to achieve a slower rate of flow you might want to look into the Mini Vigor pump. What's the single most controversial issue in the wine world today? Without doubt I'd argue that it's the good old cork taint debate. Plenty has been written on this subject, but what have been lacking are decent independent data. In fact the whole area has been so sullied by commercial interests (cork manufacturer Amorim has been busy offering hospitality to journalists, and I'd be surprised if synthetic cork manufacturers haven't been doing the same), that it is only solid results that will settle this issue once and for all. Yet more anecdotal observations and strongly held opinions won't really do. This is why I was delighted to receive through the post the first results of the Australian Wine Research Institute (AWRI) Wine Bottle Closure Trial. Published in the Australian Journal of Grape and Wine Research, this highly significant study looks like it will help answer the question of what really is the best way of sealing wine bottles. To those unfamiliar with the scientific literature, this 41 page paper would be pretty heavy going, so in this feature I'll attempt to unpack what the data really show, and assess their real significance. Taint is the most misunderstood and misreported issue in the wine world. Often based on anecdotes, the incidence of wine taint has been blamed almost exclusively on cork closures. But the hard evidence firmly demonstrates that cork taint is no longer a widespread problem. First, let’s define taint. The taint typically associated with wine corks is TCA (2,4,6-trichloroanisole). It is a harmless but ubiquitous environmental compound that gives wine a musty flavor at very low concentrations (parts per trillion). While TCA does come from cork, it also comes from sources such as contaminated winery or bottling equipment, airborne molds or chlorine-based compounds in wineries and cellars. A 2010 study scheduled for publication in the peer-reviewed American Journal of Agriculture and Food Chemistry, for example, looks at how wine barrels may introduce TCA. Wine can be spoiled for many reasons unrelated to cork or TCA. Oxidation, a common problem with plastic stoppers, can make wine smell like candy banana flavoring. Numerous bacteria and molds can also spoil wine by making it taste like everything from rancid butter to sauerkraut. But when wine fails to meet expectations, the cork gets blamed. Indeed, a recent study of 3,000 wine drinkers found that one in 20 complained that their wine was “corked” when in fact it had come from a bottle with a screw-cap. The habit of blaming cork may explain why estimates of TCA contamination based on anecdotal evidence range from 2 percent to 10 percent and above. But a large and growing amount of hard evidence concludes that the incidence of TCA has dropped precipitously in recent years and is commonly measured at less than 1 percent of wines sealed with real cork. In 1999, before the introduction of numerous improvements to cork processing, wine chemist John Casey estimated the likely incidence of TCA at below 2 percent of all wines made in Australia. Casey based his analysis of the results of 19 studies involving over 35,000 wine samples. In 2002, a survey of 5,735 bottled wines conducted by the UK Wine and Spirit Association verified that only 0.6 percent had TCA contamination. Christian Butzke, Ph.D., one of the leading wine experts in the U.S. and a vocal critic of cork taint, stated: “TCA is no longer a major problem for the U.S. wine industry.” His findings at the Indy Wine Competition found cork taint to occur at levels at or below 1%. Internationally renowned wine critic Robert Parker conducted a grenache tasting in late 2009 for almost 600 guests at Spain’s WineFuture. Less than 1 percent of the wine was affected by TCA. TCA levels are now 81% lower compared to levels found in 2001, according to the testing of more than 10 million corks by the Cork Quality Council. The decrease in the incidence of TCA is largely due to improvements implemented by the cork industry. The industry has two complementary approaches used simultaneously for dealing with TCA. The first is to use quality control measures to prevent contaminated cork from being processed into closures. The second, which is the “curative approach,” is to assume that TCA will be present and then to remove it. The results of the above studies indicate that these efforts have been a resounding success. Winemaking can be divided into two general categories: still wine production (without carbonation) and sparkling wine production (with carbonation). The science of wine and winemaking is known as oenology (in American English, oenology) and the oldest known winemaking operation, estimated to be 8,000 years old, was discovered in Georgia. After the harvest, the grapes are taken into a winery and prepared for primary ferment. At this stage red wine making diverges from white wine making. Red wine is made from the must (pulp) of red or black grapes that undergo fermentation together with the grape skins. White wine is made by fermenting juice which is made by pressing crushed grapes to extract a juice; the skins are removed and play no further role. Occasionally white wine is made from red grapes, this is done by extracting their juice with minimal contact with the grapes' skins. Rosé wines are either made from red grapes where the juice is allowed to stay in contact with the dark skins long enough to pick up a pinkish color (blanc de noir) or by blending red wine and white wine. White and rosé wines extract little of the tannins contained in the skins. To start primary fermentation yeast is added to the must for red wine or juice for white wine. During this fermentation, which often takes between one and two weeks, the yeast converts most of the sugars in the grape juice into ethanol (alcohol) and carbon dioxide. The carbon dioxide is lost to the atmosphere. After the primary fermentation of red grapes the free run wine is pumped off into tanks and the skins are pressed to extract the remaining juice and wine, the press wine blended with the free run wine at the wine maker's discretion. The wine is kept warm and the remaining sugars are converted into alcohol and carbon dioxide. The next process in the making of red wine is secondary fermentation. This is a bacterial fermentation which converts malic acid to lactic acid. This process decreases the acid in the wine and softens the taste of the wine. Red wine is sometimes transferred to oak barrels to mature for a period of weeks or months, this practice imparts oak aromas to the wine. The wine must be settled or clarified and adjustments made prior to filtration and bottling. The time from harvest to drinking can vary from a few months for Beaujolais nouveau wines to over twenty years for top wines. However, only about 10% of all red and 5% of white wine will taste better after five years than it will after just one year. Depending on the quality of grape and the target wine style, some of these steps may be combined or omitted to achieve the particular goals of the winemaker. Many wines of comparable quality are produced using similar but distinctly different approaches to their production; quality is dictated by the attributes of the starting material and not necessarily the steps taken during vinification. Variations on the above procedure exist. With sparkling wines such as Champagne, an additional fermentation takes place inside the bottle, trapping carbon dioxide and creating the characteristic bubbles. Sweet wines are made by ensuring that some residual sugar remains after fermentation is completed. This can be done by harvesting late (late harvest wine), freezing the grapes to concentrate the sugar (ice wine), or adding a substance to kill the remaining yeast before fermentation is completed; for example, high proof brandy is added when making port wine. In other cases the winemaker may choose to hold back some of the sweet grape juice and add it to the wine after the fermentation is done, a technique known as süssreserve. Mechanical harvesters are large tractors that straddle grapevine trellises and, using firm plastic or rubber rods, strike the fruiting zone of the grapevine to dislodge the grapes from the rachis. Mechanical harvesters have the advantage of being able to cover a large area of vineyard land in a relatively short period of time, and with a minimum investment of manpower per harvested ton. A disadvantage of mechanical harvesting is the indiscriminate inclusion of foreign non-grape material in the product, especially leaf stems and leaves, but also, depending on the trellis system and grapevine canopy management, may include moldy grapes,canes, metal debris, rocks and even small animals and bird nests. Some winemakers remove leaves and loose debris from the grapevine before mechanical harvesting to avoid such material being included in the harvested fruit. In the United States mechanical harvesting is seldom used for premium winemaking because of the indiscriminate picking and increased oxidation of the grape juice. In other countries (such as Australia and New Zealand), mechanical harvesting of premium winegrapes is more common because of general labor shortages. Destemming is the process of separating stems from the grapes. Depending on the winemaking procedure, this process may be undertaken before crushing with the purpose of lowering the development of tannins and vegetal flavors in the resulting wine. Single berry harvesting, like what is done with some German Trockenbeerenauslese, avoids this step altogether with the grapes being individually selected. Crushed grapes leaving the crusher. In the case of rosé wines, the fruit is crushed and the dark skins are left in contact with the juice just long enough to extract the color that the winemaker desires. The must is then pressed, and fermentation continues as if the wine maker was making a white wine. Yeast is normally already present on the grapes, often visible as a powdery appearance of the grapes. The fermentation can be done with this natural yeast, but since this can give unpredictable results depending on the exact types of yeast that are present, cultured yeast is often added to the must. One of the main problems with the use of wild ferments is the failure for the fermentation to go to completion, that is some sugar remains unfermented. This can make the wine sweet when a dry wine is desired.Frequently wild ferments lead to the production of unpleasant acetic acid (vinegar) production as a by product. During or after the alcoholic fermentation, malolactic fermentation can also take place, during which specific strains of bacteria convert malic acid into the milder lactic acid. This fermentation is often initiated by inoculation with desired bacteria. Ancient winepress in Migdal HaEmek, with the pressing area in the center and the collection vat off to the bottom left. Pressing is the act of applying pressure to grapes or pomace in order to separate juice or wine from grapes and grape skins. Pressing is not always a necessary act in winemaking; if grapes are crushed there is a considerable amount of juice immediately liberated (called free-run juice) that can be used for vinification. Typically this free-run juice is of a higher quality than the press juice. However, most wineries do use presses in order to increase their production (gallons) per ton, as pressed juice can represent between 15%-30% of the total juice volume from the grape. Presses act by positioning the grape skins or whole grape clusters between a rigid surface and a moveable surface and slowly decrease the volume between the two surfaces. Modern presses dictate the duration and pressure at each press cycle, usually ramping from 0 Bar to 2.0 Bar. Sometimes winemakers choose pressures which separate the streams of pressed juice, called making "press cuts." As the pressure increases the amount of tannin extracted from the skins into the juice increases, often rendering the pressed juice excessively tannic or harsh. Because of the location of grape juice constituents in the berry (water and acid are found primarily in the mesocarp or pulp, whereas tannins are found primarily in the pericarp, or skin, and seeds), pressed juice or wine tends to be lower in acidity with a higher pH than the free-run juice. Pigeage is a French winemaking term for the traditional stomping of grapes in open fermentation tanks. To make certain types of wine, grapes are put through a crusher and then poured into open fermentation tanks. Once fermentation begins, the grape skins are pushed to the surface by carbon dioxide gases released in the fermentation process. This layer of skins and other solids is known as the cap. As the skins are the source of the tannins, the cap needs to be mixed through the liquid each day, or "punched," which traditionally is done by stomping through the vat. 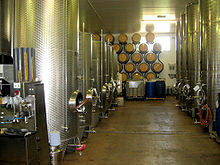 Cold stabilization is a process used in winemaking to reduce tartrate crystals (generally potassium bitartrate) in wine. These tartrate crystals look like grains of clear sand, and are also known as "wine crystals" or "wine diamonds". They are formed by the union of tartaric acid and potassium, and may appear to be sediment in the wine, though they are not. During the cold stabilizing process after fermentation, the temperature of the wine is dropped to close to freezing for 1–2 weeks. This will cause the crystals to separate from the wine and stick to the sides of the holding vessel. When the wine is drained from the vessels, the tartrates are left behind. They may also form in wine bottles that have been stored under very cold conditions. During "heat stabilization", unstable proteins are removed by adsorption onto bentonite, preventing them from precipitating in the bottled wine. The secondary fermentation usually takes place in either large stainless steel vessels with a volume of several cubic meters, or oak barrels, depending on the goals of the winemakers. Unoaked wine is fermented in a barrel made of stainless steel or other material having no influence in the final taste of the wine. Depending on the desired taste, it could be fermented mainly in stainless steel to be briefly put in oak, or have the complete fermentation done in stainless steel. Oak could be added as chips used with a non-wooden barrel instead of a fully wooden barrel. This process is mainly used in cheaper wine. Amateur winemakers often use glass carboys in the production of their wine; these vessels (sometimes called demijohns) have a capacity of 4.5 to 54 liters (1.2–14.3 US gallons). The kind of vessel used depends on the amount of wine that is being made, the grapes being used, and the intentions of the winemaker. Malolactic fermentation can improve the taste of wine that has high levels of malic acid, because malic acid in higher concentration generally causes an often unpleasant harsh and bitter taste sensation, whereas lactic acid is perceived as more gentle and less sour. The process is used in most red wines and is discretionary for white wines. Whether the wine is aging in tanks or barrels, tests are run periodically in a laboratory to check the status of the wine. Common tests include °Brix, pH, titratable acidity, residual sugar, free or available sulfur, total sulfur, volatile acidity and percent alcohol. Additional tests include those for the crystallization of cream of tartar (potassium hydrogen tartrate) and the precipitation of heat unstable protein; this last test is limited to white wines. These tests are often performed throughout the making of the wine as well as prior to bottling. In response to the results of these tests, a winemaker can then decide on appropriate remedial action, for example the addition of more sulfur dioxide. Sensory tests will also be performed and again in response to these a wine maker may take remedial action such as the addition of a protein to soften the taste of the wine. A Brix test can be run either in the lab or in the field for a quick reference number to see what the sugar content is. Brix is usually measured with a refractometer while the other methods use a hydrometer. Generally, hydrometers are a cheaper alternative. For more accurate use of sugar measurement it should be remembered that all measurements are affected by the temperature at which the reading is made. Suppliers of equipment generally will supply correction charts. Volatile acidity test verifies if there is any steam distillable acids in the wine. Mainly present is acetic acid but lactic, butyric, propionic and formic acids can also be found. Usually the test checks for these acids in a cash still, but there are new methods available such as HPLC, gas chromatography and enzymatic methods. The amount of volatile acidity found in sound grapes is negligible, since it is a by-product of microbial metabolism. It's important to remember that acetic acid bacteria require oxygen to grow. Eliminating any air in wine containers as well as a sulfur dioxide addition will limit their growth. Rejecting moldy grapes will also prevent possible problems associated with acetic acid bacteria. Use of sulfur dioxide and inoculation with a low-V.A. producing strain of Saccharomyces may deter acetic acid producing yeast. A relatively new method for removal of volatile acidity from a wine is reverse osmosis. Blending may also help—a wine with high V.A. can be filtered (to remove the microbe responsible) and blended with a low V.A. wine, so that the acetic acid level is below the sensory threshold. Gelatin has been used in winemaking for centuries and is recognized as a traditional method for wine fining, or clarifying. It is also the most commonly used agent to reduce the tannin content. Generally no gelatin remains in the wine because it reacts with the wine components, as it clarifies, and forms a sediment which is removed by filtration prior to bottling. Besides gelatin, other fining agents for wine are often derived from animal and fish products, such as micronized potassium casseinate (casein is milk protein), egg whites, egg albumin, bone char, bull's blood, isinglass (Sturgeon bladder), PVPP (a synthetic compound), lysozyme, and skim milk powder. The most common preservative used in winemaking is sulfur dioxide, achieved by adding sodium or potassium metabisulphite. Another useful preservative is potassium sorbate. In the making of red wine sulfur dioxide may be used at high levels (100 mg per liter) prior to ferment to assist stabilize color otherwise it is used at the end of malolactic ferment and performs the same functions as in white wine. However, small additions (say 20 mg per liter) should be used to avoid bleaching red pigments and the maintenance level should be about 20 mg per liter. Furthermore, small additions (say 20 mg per liter) may be made to red wine after alcoholic ferment and before malolactic ferment to overcome minor oxidation and prevent the growth of acetic acid bacteria. Potassium sorbate is effective for the control of fungal growth, including yeast, especially for sweet wines in bottle. However, one potential hazard is the metabolism of sorbate to geraniol a potent and very unpleasant by-product. To avoid this, either the wine must be sterile bottled or contain enough sulfur dioxide to inhibit the growth of bacteria. Sterile bottling includes the use of filtration. The process of clarification is concerned with the removal of particles; those larger than 5–10 micrometers for coarse polishing, particles larger than 1–4 micrometers for clarifying or polishing. Microbial stabilization requires a filtration of at least 0.65 micrometers. However, filtration at this level may lighten a wines color and body. Microbial stabilization does not imply sterility. It simply means that a significant amount of yeast and bacteria have been removed. A wine labelling machine in France. ^ Belluck, Pam (08 March 2011). "Keys, David (28 December 2003)". The Independent (London). http://www.independent.co.uk/news/science/now-thats-what-you-call-a-real-vintage-professor-unearths-8000yearold-wine-577863.html. ^ Jancis Robinson (2003). Jancis Robinson's WINE COURSE, A guide to the world of wine. BBC worldwide Ltd.. pp. 39. The English word "wine" comes from the Proto-Germanic "*winam," an early borrowing from the Latin vinum, "wine" or "(grape) vine," itself derived from the Proto-Indo-European stem *win-o- (cf. 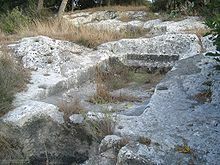 Hittite: wiyana, Lycian: Oino, Ancient Greek οá¿–νος - oînos, Aeolic Greek ÏοÎ¯νος - woinos). Although no clear evidence has been found of any linguistic connection, some scholars have noted the similarities between the words for wine in the Kartvelian (e.g. Georgian áƒ¦áƒ•áƒ˜áƒœáƒ É£vino), Indo-European languages (e.g. Russian vino), and Semitic (*wayn), hinting to the possibility that this word diffused into all these language families from a common origin. Some Georgian scholars have speculated that Georgian was the origin of this word and that it entered into the Indo-European languages via Semitic. Archaeological evidence suggests that the earliest known production of wine, made by fermenting grapes, took place as early as 8,000 years ago in Georgia and 6,100 years ago in Armenia. These locations are all within the natural area of the European grapevine Vitis vinifera. Through an extensive gene-mapping project in 2006, Dr. McGovern and his colleagues analyzed the heritage of more than 110 modern grape cultivars, and narrowed their origin to a region in Georgia, where also wine residues were discovered on the inner surfaces of 8,000-year-old ceramic storage jars in Shulavari, Georgia. Other notable areas of wine production have been discovered in Greece and date back to 4500 BC. The same sites also contain the world's earliest evidence of crushed grapes. On January 11, 2011 in one of Armenia's Vayots Dzor province cave was found a wine making press dating to approximately 6,000 years ago. Literary references to wine are abundant in Homer (9th century BC, but possibly composed even earlier), Alkman (7th century BC), and others. In Ancient Egypt, six of 36 wine amphoras were found in the tomb of King Tutankhamun bearing the name "Kha'y", a royal chief vintner. Five of these amphoras were designated as from the King's personal estate with the sixth listed as from the estate of the royal house of Aten. Traces of wine have also been found in central Asian Xinjiang, dating from the second and first millennia BC. Viticulture in India has a long history dating back to the time of the Indus Valley civilization when grapevines were believed to have been introduced from Persia sometime in the 5000 BC. The first known mentioning of grape-based wines was in the late 4th century BC writings of Chanakya who was the chief minister of Emperor Chandragupta Maurya. In his writings, Chanakya condemns the use of alcohol while chronicling the emperor and his court's frequent indulgence of a style of grape wine known as Madhu. Aglianico: Ancient noble red grape of the Campagnia region of Italy, from which sturdy red wines are made. Arinto: ( aka Pedernã). Moderately vigorous vine producing a white-wine grape. Widely grown in Portugal and used in the production of "vinho-verde" wines, along with others such as the Trajadura. Recommended rootstock is the 1103-P for good phylloxera and moderate nematode resistance, plus drought tolerance. Suitable for mildly chalky-soils. Arneis: Arneis, in Italian, means "little difficult wine." It originated and is still mostly grown in southern Piedmont's Roeri Hills, which lie between the DOCG zones of Barolo and Barbaresco. Roero Arneis is the title of the DOC zone in these hills. Arneis can produce excellent wines with perfumy characteristics of apple, pear and even hints of licorice. The Arneis grape was almost extinct in Italy due of low yields, but has seen a resurgence in the past decade. It was originally planted, not for its wine-yielding, but rather to attract bees and other insects away from the more valuable Nebbiolo grapes of Barolo and Barbaresco. Barbera: Semi-classic grape commonly grown in the Piedmont region and most of northern Italy. Now thought by some to be identical with the Perricone, or Pignatello, grape of Sardinia. Was probably imported into the U.S.A. late in the 19th century. Usually produces an intense red wine with deep color, low tannins and high acid and is used in California to provide "backbone" for so-called "jug" wines. Century-old vines still exist in many regional vineyards and allow production of long-aging, robust red wines with intense fruit and enhanced tannic content. Plantings in North America are mostly confined to the warm western coastal regions. Cabernet Sauvignon: Small, tough skinned grape that gives the distinction to the red wines of Bordeaux, although always blended with Merlot and sometimes Malbec. The best Medoc vineyards have up to 80% Cabernet, but in St. Emilion and Pomerol the Cabernet Franc is used.. Cabernet Sauvignon is widely planted in Australia, where it's best wine needs long aging, in South Africa and in California, where it has scored its greates successes outside of France. All Cabernet wines gain by age in bottle as well as wood. Cannonau: (aka Grancha in Spain, Grenache in France). A principal red-winge grape in Sardina. See grenache. Carignane: (aka Carinena and Mazuelo in Spain, Gragnano in Italy). Semi-classic grape commonly used for making red wines in Southern France and Spain. It is also successfully grown in California's Central Valley, often ending up in generic blends and "jug" wines, although some old plantings allow small lots of premium extract wine to be made. Blended with other varieties such as Cinsaut, Grenache, Mourvedre and Syrah, it has been used to create french Rhone-style red wines in California similar to the famed Chateauneuf-du-Pape blend. Carinena: alternate name for the Carignane grape in Spain. (See above). Catawba: This historically important native American - ("vitis labrusca") - grape is used to produce sweet white, red and rose' wines distinguished by a so-called "foxy" aroma component. Suitable also as a Table grape. Commonly grown in the Eastern U.S. and Canada. New York state wineries produce large amounts of sparkling wine from this grape. Its intensity can be modified by blending with other suitable labruscana derived wines such as Rougeon. Also quite popular when made into an ultra-sweet "ice-wine". Chardonnay: The grape of white burgandy (Chablis, Montrachet, Meursault, Pouilly-Ffuisse) and Champagne. This grape is the best-known white wine grape grown in France, a grape widely grown in the Champagne region. The Chardonnay is also widely planted in the Burgundy and Chablis regions. There, as in the cooler regions of North America and California, the wine made from it is often aged in small oak barrels to produce strong flavors and aromas. Possessing a fruity character - (e.g: Apple, lemon, citrus), subsequent barrel-influenced flavors include "oak", "vanilla", and malo-lactic fermentation imparted "creamy- buttery" components. Australia and New Zealand have succeeded in producing world-class wines from this grape in recent years by using cold fermentation methods that result in a desired "flinty" taste in the dry versions. Other local names in the various regions of France include the aliases Aubaine, Auvernat, Beaunois, Epinette Blanche, Petite Sainte-Marie and Weisser Clevner etc. Germany knows it as Feinburgunder. Chenin Blanc: A widely grown white-wine grape variety, known as Steen in South Africa, Pineau de la Loire in the Loire region of France and under the alias name White Pinot (Pinot Blanco) elsewhere in the world. Often made in a number of styles with or without some residual sugar. It is the favored grape of the Anjou region of France and, although naturally a hard, acidic grape slow to mature, is made into fine sweet wines that age well for a least ten years in the bottle. In the U.S. the grape all too often ends up in the generic jug wines of bulk producers as acidity enhancer for otherwise flabby high sugar/alcohol blends. Chasellas: Minor grape grown in Switzerland, France, Germany and New Zealand. Recent research indicates that the Viognier grape may be clonally related. Widely grown in the cantons of the first country where it has several regional synonym names, the main one being Fendant in the Vaud and Valais districts. It is also known as Perlan in the Mandement district. Mostly vinified to be a full, dry and fruity white wine. Also suitable as a Table grape. In France it is mostly grown in the Loire region where it is converted into a blend with Sauvignon Blanc called "Pouilly-sur-Loire" and in the Savoy region where it is treated in the Swiss manner. German growers of the Baden region know it under the name Gutedel. In New Zealand it is mainly made into popular sweet white wines. Californian and Australian growers know this variety under the alias names of Chasselas Dore or Golden Chasselas. Cinsaut: aka Cinsault). Semi-classic grape widely grown in southern France and also in the Lebanon. Used as blend component in many red or rosé wines. Transplanted to South Africa, where it was erroneously thought to be a Rhone Hermitage grape, and now a widely grown variety making a popular red wine in that country, and often blended with Cabernet Sauvignon. It has also been used to create the hybrid grape species known as Pinotage. Also grown in Australia under several alias names that include Black Prince, Blue Imperial, Oeillade and Ulliade. Corvina: (aka "Corvina Veronese"). Used with two other grapes, Rondinella and Molinara, to create the light red regional blends known as "Bardolino" and "Valpolicella" wine that have a mild fruity flavor with hints of almond. Mainly grown in the Veneto region of northeast Italy. Counoise: A semi-classic grape of the Rhone and Pyrenees regions of France. Used in the red wine blends of Chateauneuf-du-Pape to create aroma and acidic freshness. Not-recognized until recently for lableling in the US. Adds overtones of strawberry and anise. Dolcetto: The red grape, Dolcetto, like the Nebbiolo, is predominately grown in northern Italy. In Piedmont, you will find more Dolcetto and Barbera on the tables during dinnertime than Nebbiolo even though Nebbiolo is the more prized grape. The Nebbiolo wines produced are mostly exported because they demand a higher price and the winemakers need to profit. Unlike the Nebbiolo, Dolcetto grapes ripen earlier and can be planted in lesser conditions of both soil and temperature. Harvesting the Dolcetto also occurs earlier than Nebbiolo, about 4 weeks earlier. The wines have a low acidity and do not age well. Low tannins also explain Dolcetto's aging potential, or lack there of. The name Dolcetto derives from the Italian phrase, "little sweet one." They produce wines that are fairly sweet even though the sugar levels of this grape are no higher than the norm. It is the low tannin level that exaggerates the sugar level and explains the sweetness. Ehrenfelser: Grape resulting from the crossing of Johannisberg Riesling and a Sylvaner clone. Many consider it second only to the Kerner grape-cross as a frost-resistant Riesling type substitute for the better known Muller-Thurgau grape widely grown in Germany and elsewhere. Mild acid content discourages aging. Claimed to have excellent Riesling grape similarities in taste etc. Small acreages can now be found in the Okanagan region of western Canada, where it appears to do well. Fiano: Minor, but of ancient origin, grape grown in Campania region of southern Italy. Makes balanced, elegant white wine with attractive nut-like hints in the aroma. Freisa: Medium bodied red winegrape from the Piedmont region of Italy.Freisa's origin dates back to 1799 in Piedmont. The red Freisa grape must be aged for 2 years before bottling. It often produces frizzante, highly acidic, pale cherry red wines, but could range from still to frizzante and dry to sweet. There are two slightly different clones of Freisa. Freisa Piccola grows usually on the hills and Freisa Grossa grows better on flatter surfaces. It is also called Fresa and Fresia. Gamay: Only makes first class wine on the graite hills of Beaujolais, with their sandy soil. In the rest of Burgandy it is an inferior variety, although adequate in certain other parts of France (the Loire, Ardeche), in Switzerland and (alias Napa Gamay in California. At its best Gamay produces wine that is incomparably light, fruity aand gulpable, pale red, or, exceptionally, a dark wine aging well vof six or seven years. Gewurztraminer: ("geh-verts-tram-in-er"). A clone of the parent Traminer varietal. Widely grown, and one of the mainstay grapes for which the Alsace is famous, the popular Gewurztraminer produces white wines with a strong floral aroma and lychee nut like flavor. It is often regarded as somewhat similar in style to the Johannisberg Riesling when vinified as slightly sweet yet tart. Occasionally it is made into a "botrytized" late harvest dessert style wine. Does well in the cooler coastal regions of Western U.S., Australia, New Zealand and B.C. Interior,Canada . Grenache: Grenache is the second most planted grape in the world, but in the United States Grenache it only ranks in the top 10. California mostly uses this red grape for jug wine blends, rosé and the White Grenache. There are Rhone wine enthusiasts attempting to filter the Grenache into their blends. 98 percent of all Grenache vines are found in the hot Central Valley because it does relatively well in dry, hot conditions and its strong stalks make it well suited for windy conditions as well. When ripe, Grenache has a very high sugar level and can produce wines with 15 to 16 percent alcohol. The wines are sweet, fruity and contain very little tannins. Grenache comes in both red and white varieties, but unless specified, Grenache refers to the red version, Grenache Noir. Grenache Blanc or Garnacha Blance is the white version of this grape. Although not as popular as the red in California, it is widely planted in Spain (as garnacha) and France. The white wines produced are high in alcohol and low in acid. Grechetto: The white Grechetto is the primary ingredient in Orvieto DOC in Umbria. It is also used in the production of Torgiano DOC. Grechetto has a distinctive nutty character which allows it to make an excellent Vin Santo.It is often blended with Trebbiano Toscano and Malvasia. Johannisberg Riesling: A white-wine variety widely grown along the Rhine river and tributaries - (e.g: Rheingau, Rheinhessen, Mosel, Nahe regions etc.) - in Germany and also in other temperate regions of Europe. It is also grown in N. America, where it can produce a flowery, fruity dry wine with high acid and low alcohol not unlike the german "Kabinett" version or a semi-dry style with some residual sugar similar to the german "Spatlese" version. If infected with appropriate amounts of "botrytis", it can make outstanding late-harvest wines - (e.g: comparable to the german "Auslese" series). The Finger Lakes region of New York state in the U.S. produces excellent versions in the Mosel style and the North-West coast of N. America seems to have the right conditions for creating the richer, earthier Rheinhessen taste, as do the cooler regions of California. Australia now produces excellent versions of the dry, crisp Alsation-style, as well as fruitier semi-sweet Mosel-type wines, as has New Zealand in recent years. The latest picked variety and also one of the hardiest. The vines have been known to withstand -20 Celcius without bud damage or winterkill. Kerner: Moderately hardy grape developed from a cross between the Riesling and Schiava Grossa grapes. The latter variety is known as the Trollinger where grown in Germany. Used to produce a Riesling-like white wine said to often reach "Auslese" Prädikat quality. Regarded by many as having superior characteristics to the Bacchus or Optima grapes. Currently, 1997, recommended for good site locations in southern Michigan and other suitable cool climate regions where it usually fully ripens in mid-season. Lagrein: Lagrein is almost exclusively grown in Trentino-Alto Adige, and produces both light and dark red wines. These wines tend to have an almost chocolatety taste and rich, fruit flavors. Lagrein is a late-ripening vine, therefore needs warmer climates to develop. Santa Maddalena DOC in Alto Adige uses Lagrein along with Schiava for its wines. Macebeo: (aka Maccabeo). Widely grown in the Rioja region of north-eastern Spain and the Languedoc region of France, this grape is used to make mildly acidic and young white wines suitable for early consumption or incorporation into suitable blends. Also known in Spain by an alias name of Viura. Malvasia: Malvasia has been cultivated in Europe for 2,000 years. Its origin is thought to be from the Aegean Sea area, between Turkey and Greece. Malvasia is primarily a white wine grape, but it has many known red subvarieties including Malvasia Nera. Malvasia Nera is mostly grown in Puglia. Malvasia is one of two white grapes allowed in Chianti's blend, Trebbiano being the other. It is also blended with Trebbiano to produce Frascati, Marino, Est!Est !!Est!! !, and Galestro. All are DOC zones. Malvasia is one white grape that does have the potential to produce bold wines able to age well. It does, however, oxidize rather quickly. It is not a high-yielding vine and has begun to be replaced by grapes like Trebbiano. Marsanne: Vigorous high yielding white grape from the Rhone valley. Malbec: Semi-classic grape grown in the Bordeaux region of France and in other areas under the name Côt and in the Alsace has the local name Auxerrois. Also grown in the cooler regions of California. In Argentina the grape known as the Fer is now thought to be a clone of this variety. Alone it creates a rather inky red, intense wine, so it is mainly used in blends, such as with Merlot and Cabernet Sauvignon to create the world renowned red Bordeaux "claret" blend. In California and other areas it is increasingly being used for the same blending purpose. Merlot: Classic grape widely grown in the Bordeaux region of France and elsewhere. The red wine bears a resemblance to Cabernet Sauvignon wine, with which it is sometimes blended, but is usually not so intense, with softer tannins. Matures earlier than Cabernet Sauvignon. In California it is a popular varietal on its own and also as a percentage constituent of the red wine blend resembling Bordeaux claret called "Meritage". It does extremely well in the state of Washington and shows great promise on Long Island, N.Y. Other countries such as Canada, Chile, Argentina and New Zealand also seem to have the right climate for this variety. B.C. Merlot grapes attain good sugar and acid balance however the style is more of Bordeaux than Washington state. Montepulciano: Montepulciano is a name of a city in Tuscany, but the grape is mostly planted in Abruzzi and Marches. Its composition is completely different than Sangiovese. It is soft and supple. It ripens later than Sangiovese and is lower in acidity and tannins. It is thought that Montepulciano originated in Tuscany. The region Abruzzi produces, what most consider, the best Montepulciano in Italy. These grapes are full bodied and robust with the potential for aging. Sangiovese is sometimes blended with Montepulciano. Rosso Piceno, a DOC zone in eastern Marches, uses 40 percent Montepulciano with 60 percent Sangiovese. Montepulciano is also a small component of Torgiano, a DOC and DOCG zone in Umbria as well as Cori Rosso, DOC in Latium, Cerveteri, DOC in Latium, and Montepulciano d'Abruzzi DOC in Abruzzi. Moscato: A white grape used for both Asti Spumante DOCG, Moscato d'Alba DOCG and other sparkling white wines. It is Piedmont's oldest grape. Known as Muscat in California. Mourvedre: Red winegrape from the Rhone valley blended with Grenache; also found in Spain where it is known as Monastrell or Mataro. Muller-Thurgau: Early ripening cross officially developed from Sylvaner and Johannisberg Riesling, but some authorities now contend was actually from two clonal varieties of Riesling. Produces a flowery, yet acidic white wine that bears a modest resemblance to the parent Riesling grapewine. Widely planted in Europe, New Zealand and some parts of the cooler Northern regions of N. America. Known as Rivaner in parts of Europe. Losing production to both Chardonnay and Sauvignon Blanc. Muscadet: (aka Melon de Bourgogne). Temperate climate grape widely grown in the western-most area of the Loire region of France. The product juice goes into the making of the dry, tart white wine that is famous as "Muscadet de Sevres et Maine". The wine is light, fresh with distinctive fruit in its better years and is best consumed while young. Possibly grown also in California where recent research indicates some plantings may have been mis-named the Pinot Blanc. Muscat: Another "cépage" family of clone varieties, making both red and white wines. Most are of the muscat type, having the unique aromatic character commonly associated with muscat wines. These include the Muscat Blanc, (aka Moscato di Canelli and Muscat Frontignon, all alias names for the premier cépage varietal Muscat Blanc à Petit Grains). These clones are mostly used for making medium-sweet and dessert style table or fortified wines. An example of these is "Constantia", a centuries-old wine blend still made in South Africa from the Orange Muscat grape, a darker skinned mutation of the Muscat Frontignan clone and wine made from the Pontac, a red-wine grape translocated from south-west France. Small acreages of Orange Muscat in the Central Valley of California allow a local variation of this wine to be made by at least one producer, a situation that also occurs in Australia. Hot climate producers of sparkling wines often use the various Muscat grape clones to create wines in the style of Italian Spumante. Lesser regarded clones of the cépage include Muscat of Alexandria and others. Nebbiolo: The Nebbiolo grape has proven to be one of the most difficult grapes to grown the world. It shares this honor with Pinot Noir or Pinot Nero. The name, Nebbiolo, derives from the the Italian word for fog, "nebbia." It is harvested late in the season, relative to other grapes (usually in October) when the Langhe Hills in Piedmont are covered with fog. It is this fog which forced the Nebbiolo to evolve into a thick-skinned grape. Within these thick skins, bold and heavy tannins, which allow the Nebbiolo to age, are found. Growing the Nebbiolo in the northern regions of Italy dates back to 1268. It is used both as a individual grape to produce some of the most sought after wines in the world, and a blending grape is many different DOC and DOCG zones. Barolo DOCG, Barbaresco DOCG and Gattinara DOCG (which only needs to be 90 percent Nebbiolo) all utilize Nebbiolo's bold character, along with its tannins, to produce fantastic wines. Piedmont and Lombardy are the two regions where growing the Nebbiolo grape is most prevalent. Nebbiolo, as stated before, is not only used by itself, it is sometimes blended with other grapes. For example, Gattinara only needs to contain 90 percent Nebbiolo. The other 10 percent is normally Bonarda, another red grape grown mostly in northern Italy. Another example is Nebbiolo d'Alba DOC around the city of Alba. Here Nebbiolo is blended with 5 percent Arneis. Arneis is a white grape mostly grown in the Roero Hills between Barolo and Barbaresco. Nebbiolo can also be blended with Vespolina Also known as the Chiavennasca in Lombardy. Negroamaro: Negroamaro means "bitter black" in Italian and the grape lives up to its name. Negroamaro is a dark and spicy grape that blends well with Malvasia Nera. Both Negroamaro and Malvasia Nera are sometimes shipped north to be used in Chianti, up to 10 percent. This does not happen as much today. Negroamaro grows well on a flat peninsula in Puglia called Salento. Palomino: Red wine grape, mostly used for Sherry-type fortified wines, widely grown in Spain and South Africa. Identical to the Listan variety found in France. Also found in Australia and California where it is also used mainly to produce fortified wines. The grape was once thought to be the Golden Chasselas, a table grape, where grown in California. The wine-must has tendency to oxidise quickly, a characteristic that can be ignored when used for sherry production. Pedro Ximenez: Red wine variety found in Australia and used, along with Palomino, to produce fortified wines. Petite Cabernet: An alias for Cabernet Sauvignon. Petite Verdot: Grape grown in limited amounts. Found mainly in the temperate Bordeaux region St.Émilion subdistrict and used to make a red wine later blended with other famous Bordeaux varietal wines. Recommended for growing in the State of Virginia. Has higher titratable acid and is slightly more cold-hardy than Cabernet Sauvignon, ripening around the same time in mid-late October. Petite Vidure: An alias for Cabernet Sauvignon. Pinot Bianco: Italian version of the grape known as Pinot Blanc. Grown mainly in the Trentino and Fruili regions of Italy. Usually made into a fresh, fruity white wine. Pinot Blanc: Mutation of the Pinot Gris vine. Grape is generally used to make dry, crisp, rather intense white wines in the Alsace, parts of Burgundy and in Austria. In the latter country it is known as the Weissburgunder. In California, a similarly named grape is used to make a fruity, rather subtle wine similar to the simpler versions of Chardonnay. Used in many of the better champagne style sparkling wines of California because of its acid content and clean flavor. Pinot Grigio: Originally grown in France and then brought to Italy. It is DOC in Oltrepò Pavese and Franciacorta. It is also grown around Lake d'Iseo in Lombardy. Pinot Grigio is the most popular grape grown in northern Italy. Pinot Meunier: (aka Meunier). Clone of Pinot Noir cepage. Widely grown in the Champagne (Aube) region of France. Used in the blend with Chardonnay to make champagne sparkling wine. Pinot Noir: Pinot Noir’s best representation is from Burgundy's Côte D’or region, and has been for an estimated 2,000 years. When young, a good Pinot Noir exhibits the simpler and fruity characteristics of cherry, plum and raspberries. As they age, they become more rich and complex and will continue to do so in proper conditions. Some say that Pinot Noir is more complex than Cabernet Sauvignon, but it do not age as well. Pinot Noir is widely used in French Champagne so the grapes are picked at low sugar levels with high acidity. They are then blended with Chardonnay, which is also picked at low sugar levels and high acidity. Pinot Noir is also used in the production of California Champagne. In fact, 1/3 of all Pinot Noir grown is used for sparkling wines. 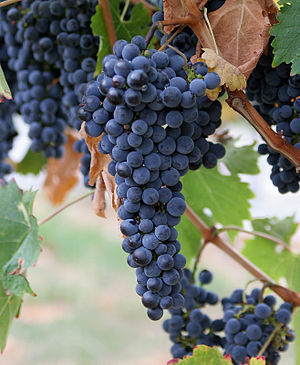 The Pinot Noir grape is extremely difficult to grow. If it does not have the correct environment and care, the wines can be uninviting. California once regarded Pinot Noir as a great and complex red, but in the 1970’s, Merlot and Zinfandel knocked it out of second place and production levels shrank. Dedicated Pinot Noir growers were not discouraged and continued experiments with clones, stem retention in fermentation, open versus closed fermentation, crop levels and soil types. Progress was made. The consensus is that it must not be allowed to ripen too much or the fruit will diminish. Also, Pinot Noir likes cooler temperatures, instead of next to Cabernet Sauvignon in the hot Central Valley, where it was originally planted. Many areas have had success with this grape. Among these include the Carneros District in southern Napa and Sonoma counties, the near-coastal Russian River Valley, the cool areas south of San Francisco in Monterey, San Luis Obispo, and Santa Barbara Counties. Pinot Noir can now challenge the number two spot among California’s red grapes. It is also known as the Italian Pinot Nero and is grown in both Lombardy and Umbria. It is sometimes added to Chianti. Primitivo: Primitivo is a great grape for blending. It is strong, rich, spicy , similiar to Negroamaro. Primitivo grows well a flat peninsula in Puglia called Salento. It is thought to be an ancestor of the California Zinfandel grape. Prugnolo: Prugnolo is another name for Sangiovese Grosso. It is called Prugnolo because of its plummy color. It is the grape that forms Vino Nobile di Montepulciano DOCG and Rosso di Montepulciano DOC. Both wines are produced in Montepulciano, a city east of Siena in Tuscany. (Don't confuse Montepulciano the city with Montepulciano the grape.) Prugnolo is 50-70 percent of Vino Nobile di Montepulciano. The other grapes used are Canaiolo and Cabernet Sauvignon. Rousanne: Delicate end elegant white grape from the Rhone valley. Sangiovese: The most influential grape grown in central Italy, more specifically in Tuscany. The name, Sangiovese, is derived from Sangius Jovis or "Blood of Jupiter." The Sangiovese grape's skins are thick and full of tannins. Sangiovese's most important role in the wine industry is the composition of Chianti DOCG, Italy's most popular wine. Sangiovese is typically blended with Canaiolo and either Malvasia or Trebbiano. Other red grapes such as Cabernet Sauvignon, Malvasia Nera, Mammolo and Syrah can also be added, up to 10 percent. Sangiovese is the main component of Chianti and its percentage has risen over the past 20 years. Heavy tannins from Sangiovese allow wines age for decades. When Chianti is labeled riserva, a higher proportion of Sangiovese is used in the uvaggio. Uvaggio is the term for the grape mix for each wine. For the normale, the most common style of Chianti, less Sangiovese is used and more Canaiolo or Mammolo is blended. There are clones of Sangiovese used to produce other wines in Tuscany, Latium, Marches and Emilia-Romagna. Sangiovese Grosso and Sangiovese Piccolo are two examples of clones. One of Sangiovese Grosso's strains is called Brunello. It is this grape that creates another of the world's most treasured wines, Brunello di Montalcino DOCG. Sangiovese is also grown in Emilia-Romagna and Latium to produce some of Italy's cheapest red wine. Savagnin: Semi-classic grape used to create the celebrated "Vin jaune" of the Jura region of France. Is one of the few wines in which maderization is desirable and acquired with long bottle-aging. Thought by some to be identical with the Traminer grape still grown in that area of Europe. Sometimes called Klevner in the Alsace region of France. Sauvignon Blanc: Classic white-wine variety commonly planted in the Bordeaux and eastern Loire regions of France. Still a widely grown varietal in the U.S., its production has declined in favor of the popular Chardonnay. It shows a tendency towards a grassy, herbaceous flavor in the wine when the grapes are grown in temperate regions. In warmer regions, the flavors and aromas tend to be more citruslike, (e.g: grapefruit or pear), plus the characteristic "earthy" taste. New Zealand has had much success with the grape in recent years. Schiava: A red grape grown in Trentino-Alto Adige, more specifically in Alto Adige. It is DOC in Lago di Caldaro and Santa Maddalena, both are in Alto Adige. Schiava wines are light in color. It is also called Vernatsch. Semillion: Semi-classic grape widely grown in the Bordeaux region of France and also elsewhere. This grape variety has a distinct fig-like character. In France, Australia and increasingly in California it is often blended with Sauvignon Blanc to cut some of the strong "gooseberry" flavor of the latter grape and create better balance. Wineries in many countries also use the grape to create dry single-varietal white wines. When infected by the "noble rot" fungi, (Botrytis cineria), it can be used to produce first-class sweet white wines such as those of the french Sauternes. The B.C. grape has proven very hardy and is only being experimented with of late. Scheurebe: Grape variety developed from a cross between Sylvaner and Johannisberg Riesling. Extensively planted in the Rheinhessen, Rheinfalz and Franconia regions of Germany. Used to produce full-bodied, aromatic white wines that can reach "Auslese" Pradikat standard in the better vintages. Sylvaner: (aka Silvaner) Widely grown in the Alsace region of France, Germany and Central Europe. Suited to temperate zones, the vine is high-yielding and the grape produces an "easy" white wine with lightly spicy, floral flavors and mild intensity. Once very popular in California, it seems to have fallen victim to changing fashion in recent years and been replaced by (Johannisberg) Riesling in current taste. Belief that it had been crossed with the latter grape to yield the Müller-Thurgau hybrid grape is now in doubt. It is still believed to be involved as one parent in the creation of another hybrid version called Scheurebe as well as several other crossings of a similar nature - (e.g: Bacchus, Optima). Syrah: Noble red winegrape of the Rhone valley of France, and also known as Shiraz in Australia or the Serine. Temperanillo: Fine red wine grape used in best Rioja wines of Spain. Also known under the alias names of Cencibel and Valdepeñas. In Portugal the grape is known as the (Tinta) Roriz. Large acreages are grown in Argentina. Also found in the Central Valley of California. Makes a grapejuice much favored by home-winemakers that is sold under the "Valdepenas" name in N. America. Called Ull de Lebre in Catalonia. Traminer: Parent grape of the popular Gewürztraminer clone. Still grown in France and in California but almost everywhere has been replaced by its much more intense and aromatic offspring clone. This name is still used in Australia as an alias name for Gewürztraminer and itself is also known there under the alias name of Sauvignon Rose, (and should not to be confused with an identical alias used in France for a member of the Sauvignon Blanc cépage). Trebbiano: Italy's most widely planted white grape. The reason for its popularity is the high yields it achieves throughout Italy. The grape also shows high resistance to diseases. There are 3 clones of the Trebbiano grape: Tuscan, Romagnolan and Giallo (yellow). Trebbiano is one of the two white grapes that may be used in Chianti, Malvasia being the other. Up to 10 percent Trebbiano can be used in Chianti's blend. Trebbiano is a major component in many wines, including Verdicchio. In Verdicchio, Malvasia and Trebbiano are blended with the Verdicchio grape. It is DOC in Trebbiano d'Abruzzi, Orvieto, Est!Est!!Est!!! and DOC red wines like Cirò and Montefalco Rosso. Ugni Blanc: (aka Trebbiano). Widely grown in Italy and Southern France. There it produces a fruity, acidic white wine, best drunk when young and chilled. In the Cognac region of France and in Australia it is known as the St. Émilion grape. Australian growers also know this variety under the alias names of White Hermitage and White Shiraz. Verdiccio: Grown in Marches since the fourteenth century. The wines are clean, crisp and thanks to technology, virtually colorless. There are two DOC zones where Verdicchio is produced, both are in Marches and are 80 percent Verdicchio. They are Verdicchio dei Colli Pesaresi DOC and Verdicchio di Matelica DOC. Verdicchio di Matelica has the more body of the two. It is blended with Trebbiano and Malvasia. Verdicchio is aged in wood and will yield a crisp and nutty wine. This grape also makes a good sparkling wine because of the natural acidity. The sparkling wine could either be produced by Charmat method or the classic bottle fermentation. Viognier: White grape from the Rhone valley that is floral and fruity in taste. Viura: White grape commonly blended with Malvasia in White Riojas. Zinfandel: An important grape variety, also thought to be the variety once known as Black St. Peter in early 19th century California lore, currently grown in California and used to produce robust red wine as well as very popular "blush wines" called "white Zinfandel". Zinfandel is noted for the fruit-laden, berry-like aroma and prickly taste characteristics in its red version and pleasant strawberry reminders when made into a "blush" wine. While its origins are not clear it has been tentatively identified as the Primitivo (di Gioia), a grape species found in Apulia, southern Italy. According to a recent report this grape may also be identical to the Vranac grape found in Montenegro, the state that, combined with Serbia, constitutes what remains of the former Yugoslavia. Another, somewhat suspect, clone contender is the Plavac Mali from the coastal area known as Dalmatia, a province of Croatia also recently a part of the former Yugoslavia and located just across the Adriatic sea from the shores of Italian Apulia. If not consumed as fresh fruits, or as a whole, they’re transformed into grape jellies, jams, wines, and raisins. Such a versatile fruit must have surprising health benefits to boast of, right? Over the past years, science has proven that consumption of grapes can do you good, beyond what you could have possibly imagined. It helps with the prevention of heart diseases, metabolic syndrome, cancer, and gastrointestinal diseases. Grapes contain natural antioxidants to a high degree. These antioxidants are beneficial for supporting and protecting your body against unwanted immune damage. Such immune damage makes you a liability for various diseases including cancer, cardiovascular diseases, and liver damage. The most fundamental role of an immune system is to provide support for metabolic activities while protecting against damaged cells from reproducing quickly. The vitamin D and resveratrol antioxidant in grapes suggest better defense against the spread of chronic diseases and impaired cells. It even helps heal wounds and infections faster. Key Takeaway: Grapes contain a good amount of resveratrol antioxidants that work well with vitamin D to provide protection against many diseases. The daily consumption of grapes will help you fight infections, recover from injuries and diseases faster, and overall transform your health back to normal. They dramatically strengthen the immune system. Heart diseases such as atherosclerosis are characterized by the hardening and thinning of the artery muscles. Factors such as high cholesterol levels, heart attack, stroke, smoking, and high blood pressure cause the narrowing of the blood vessels responsible for carrying blood from the heart to other parts of the body. It can cause plaque buildup in the arteries, and if left untreated for a long time, it could lead to permanent blockages. They’re good nutrients for proper activation of proteins in the body that restrict cell damage. Key Takeaway: Grapes are loaded with nutritive polyphenols that can improve your cardiovascular health. Studies show that grape eaters have a lower risk of developing atherosclerosis, which is a harmful cardiovascular disease. Cognitive fitness is as important as physical fitness, especially for adults. While you go outside for a walk or a run everyday to prevent age-related physical breakdowns, a healthy diet is one of the best ways to remain focused as you get older. Fruits high in unsaturated fats, low in cholesterol, and contain powerful antioxidants such as resveratrol have a potential of preventing age-related memory loss. Resveratrol is good for the heart, as I’ve already discussed above, but a lesser known fact is that it’s beneficial for the hippocampus of the brain. The hippocampus is responsible for memory, mood, and learning abilities of the brain. And while age-related memory loss is a part of many aging disorders for older adults, anything that has a positive effect on cognitive ability is a good thing. Key Takeaway: A study conducted on aged rats showed that resveratrol-rich diets showed both memory improvement and spatial learning enhancement within 25 months of treatment. Hence, it can improve overall memory loss disabilities for people embracing the old age streak. If you didn’t already know, not all fruit juices are good for diabetic patients. The consumption of only a few fruit juices lower the risk of developing type 2 diabetes, while some indicate a higher risk. To determine which fruits’ juice is beneficial for people struggling with type 2 diabetes, BMJ conducted a simple study. The main outcome was determined by studying women with type 2 diabetes. It varied from whole fruit consumption of bananas, grapes, raisins, strawberries, apples, pears, and many other fruits. Key Takeaway: The overproduction of glucose leads to type 2 diabetes. This is caused by lack of exercise, unhealthy food habits, and high cholesterol levels in the body. Grapes help correct such a characteristic. Consuming greater amounts of grapes fruit juice is associated with a lower risk of developing diabetes, especially type 2 diabetes in patients. Ultraviolet radiation is a significant agent of skin cancer and other symptoms of skin cell damage. Although UV rays are supposedly good for vitamin D and endorphins proliferation in the skin cells, they do carry dangerous risks. As you already know, skin is the most primary and the largest organ of your body. It possesses two significant layers: epidermis and dermis. Any damage to even one of these layers can cause serious environmentally-induced skin disorders. Key Takeaway: Grape eaters have a much lower risk of suffering from skin damage caused by harmful UV rays. It appears that the flavonoids present in grapes have a positive effect on the prevention and treatment of skin cancer and other harmful skin diseases. Grapes can combat severe vitamin K deficiency, which is also important for boosting the function of bones in the body. If you often suffer from bone fractures, joint pains, and weakness, you have low bone mineral density. You need dietary vitamin K in your daily diet to lower age-related and induced bone damage. Diseases such as osteoporosis arise from vitamin K and calcium deficiency. So along with your routine nutritive foods, grapes are extremely powerful for good bone health. The amount of vitamin K you consume affects your body’s ability to strengthen and boost bone health and performance. Key Takeaway: Vitamin K intake helps prevent bone damage dramatically. It is incredibly nutritious for protecting the bones from fracture, breaks, and other bone conditions like osteoporosis. Eating grapes regularly has a significant impact on improving bone mineral density. Metabolic syndrome interferes with the body’s normal functioning, causing cardiovascular diseases like coronary heart disease, diabetes, and even a sudden heart attack. To decrease the risk of developing metabolic syndrome, grape intake in very necessary. It protects against the damages of metabolic syndrome on different organs of the body. The polyphenols have a positive effect on the liver, kidneys, heart, and fat tissues of the body. All of these parts are greatly affected by the metabolic syndrome. In a span of 90 days, the study concluded that a grape-rich diet on obesity-prone rats showed drastic improvement in antioxidant defense and anti-inflammatory response. Especially for preventing liver damage and heart failure, this is principally important. Key Takeaway: High doses of grapes appear to alleviate metabolic syndrome symptoms in people with a higher risk of developing immune disorders. In a study conducted on rats over a span of 90 days, increase in grape intake proved beneficial for reducing inflammation and oxidative stress that gave birth to metabolic syndrome. Oxidative stress are caused by many factors such as inflammation, environmentally-induced stress, genetic factors, and age-related disorders. For proper cellular regulation and anti-inflammatory effects, reduced levels of oxidative stress is essential. In addition to medical treatment, a natural medicine such as healthy fruits work well to prevent the ever-increasing symptoms of oxidative stress in the body. You want to protect yourself from pathogens and harmful toxic chemicals, both of us have detrimental effects. Key Takeaway: Factors that significantly increase oxidative stress in the body can be treated and controlled with the help of grapes. They contain powerful antioxidants that are essential for the prevention of chronic diseases characterized by oxidative stress. It supports the body’s immune system and may reduce the risk of developing age-related disorders. Grapes are one of the most effective fruits to eat to fight constipation. They contain dietary fiber, organic acid, cellulose, and sugar. On the whole, increasing your dietary fiber intake has many health benefits, including reducing cholesterol levels, preventing hypertension, reflux disease, and lowering blood pressure. That said, grapes are considered a laxative food because of the combination of antioxidants, fiber, and other nutrients it contains. Laxatives are natural remedies for people with irregular bowel movements. So proper grape consumption on a daily basis is most beneficial along with regular exercise. Key Takeaway: Grapes contain dietary fiber and powerful nutrients which have positive effects on your digestive system. It also helps relieve constipation, which is the symptom of bowel obstruction and weak metabolic functioning. People who eat a grape-rich diet show improvements in passing stools without any difficulty. Did you ever wonder why people drink red wine in moderation as a natural health remedy? Extracted from grape, it contains a powerful compound called resveratrol which has a positive effect on killing cancer cells. To block cancer cells from proliferating, the body needs to block protein from feeding the damaged cells. The resveratrol compound is responsible for proper regulation of protein in the cells. That said, the anti-inflammatory properties of grapes creates a less oxidative environment, making it difficult for the cancer cells to reproduce and damage other healthy cells in the body. Key Takeaway: Grapes contain compounds that help fight cancer more effectively. They are anti-cancer agents that cause cancer cells to rapidly deteriorate rather than spread throughout the body. Combined with therapy, consuming grapes or grape juice on a regular basis has anti-inflammatory and anti-cancer benefits. The intake of polyphenols shows a modifiable improvement in patients with high blood pressure. It protects the body against cardiovascular diseases, hence reducing our body’s inflammation and tendency to fight against free radical damage. Polyphenols are great contributors to blood pressure stimulation. They control excessive inflammation in the body which helps alleviating high blood pressure symptoms of hypertension. Keeping in mind that a spike in high blood pressure could lead to sudden heart stroke or plaque buildup restricting proper blood flow from the heart to different organs of the body. There’s a direct association between the biological and chemical properties of polyphenols to regulate anti-hypertensive and anti-inflammatory functions. It increases and enhances optimal blood coagulation factors. Key Takeaway: A grape-rich diet can reduce the rate of high blood pressure in adults. It increases the body’s ability to fight against hypertension and other cardiovascular diseases, especially in people who have a high blood pressure problems.